Water Kefir FAQ Frequently Asked Questions - What is Water Kefir? 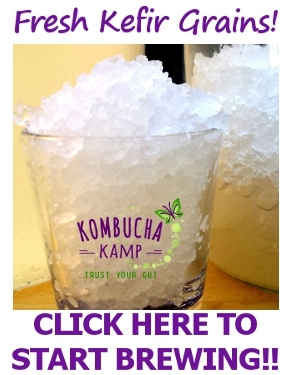 Welcome to the Kombucha Kamp Water Kefir FAQ, a great place to get all your kefir questions answered. Can’t find your answer in our water kefir faq? Try our Water Kefir Recipe page or drop us a line via the Contact Page. Water kefir is a probiotic beverage made from sugar water to which we then add water kefir grains. Water kefir has a lightly sweet, refreshing flavor created by the fermentation of sugar by bacteria and yeast. Water kefir has a sweeter, lighter flavor than Kombucha. It hits the palate higher in the mouth than the acids in Kombucha. Adding flavors will yield a variety of results with ginger, fruit and herbs being the most popular additives. Coconut water kefir has a unique flavor profile devoid of sweetness when fermented without any additional sugar. Just like grape juice doesn’t taste the same as wine, whatever substrate we ferment will have a different flavor and mouthfeel than what it is originally made from. Here is a Coconut Water Kefir Recipe. Milk kefir is the “original” kefir. Made from milk, it provides an enhanced nutrient profile due to the fermentation process. Water kefir is a polysaccharide that thrives on sucrose. The process of making water and milk kefir is similar and both of the cultures are known as “grains.” However, that is where their similarity ends. Each comprise a unique and different groups of bacteria and yeast. What’s the difference between water kefir, ginger beer plant and ginger bug? Why is kefir good for health? Tibicos is the traditional name for water kefir grains. According to some stories, they first grew on a cactus in Mexico, but the science is hard to come by. Where does the water kefir grain (tibicos) come from? Water kefir grains are purported to have originated in Mexico where they supposedly appeared as crystals on the paddles of a cactus plant. The grains themselves are a polysaccharide created by the bacteria and yeast which then consume the sucrose (table sugar) in the water. In exchange for the nutrients, they create healthy acids as well as a host of organisms that support the human microbiome. There are many other names, and almost all of them refer to “bees.” Could that be a clue to their origin? Or a name that derived from the way the grains “buzz” up and down in the liquid as they ferment? Nobody is sure, but here are some of those other names: Tibicos, tibi, sugar kefir grains, Japanese water crystals, California bees, Tibetan Sea Bees, bébées, African bees, ale nuts, Australian bees, balm of Gilead, beer seeds, beer plant, bees, ginger bees, Japanese beer seeds and vinegar bees. What do water kefir grains look like? Water kefir grains look like large salt crystals. They are usually clear or slightly gray in coloring and have a firm texture. Using different types of sugar or juice will impact their color (molasses turns them light brown for example) though switching back to white sugar will cause them to turn clear again. Do water kefir grains change shape? Yes. At first, they look like sand and gradually they agglomerate into larger crystals. Or, if not fed consistently, the crystals will diminish and then get sandy again. Don’t toss those little grains though as they can often be nourished into larger grains with frequent feedings and attention. How much water kefir grains do you need? You will need 2 tablespoons of water kefir grains to ferment 1 quart of water kefir. 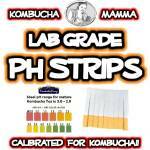 You may scale the ratio depending on what size batch of water kefir you want to make. Is it possible to use too many water kefir grains? Yes but it is easy to remedy. If there are too many grains in the sugar water then they may ferment the sugar solution too quickly. This can lead to funkier flavors and a deterioration of the grains. However, there is a simple solution, remove some of the grains! Give them to friends, pop them in your mouth like a probiotic pearl, or compost in the garden. Yes. Reuse the same grains multiple times. If they were previously dehydrated, they may not reproduce but will ferment the sugar water. If they are living water kefir grains, expect them to proliferate! 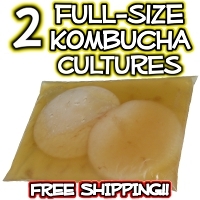 Do water kefir grains multiply? Yes! Water kefir grains are very prolific provided they have the right environment to thrive. They prefer 68-78°F (20-26°C) (on the warmer side for reproducing usually), in addition to white sugar with occasional minerals added in the form of a dollop of molasses or dried fig or apricot. How fast do water kefir grains grow? Water kefir grains will grow more quickly with the ideal conditions. They are hungry and like to be fed everyday. Expect them to double within a week if fed frequently. Do you have to feed water kefir grains every day? If the goal is to get the grains to multiply, then feed them everyday. Or if you have enough, they can be left to ferment one quart of sugar water for 2-3 days. Leave them longer and they may disintegrate or if left in the fridge they may go dormant so that you may revive them at a later date. Is it okay to cut, chop, or blend water kefir grains? Yes! The organisms are microscopic, so cutting, chopping or blending doesn’t damage the cultures it simply makes the grains smaller. Should I rinse my water kefir grains? Rinsing is not required for water kefir grains unless excess yeast strands are causing too much carbonation. Rinse in filtered or otherwise dechlorinated water if needed. Do water kefir grains need to rest? No. Water kefir grains love attention. The more you work with them the happier they are. Can I use water kefir grains that fell into the sink or on the floor? Grains can be recaptured from the floor or sink if then rinsed well. However, they proliferate quickly so unless they are literally the ONLY the grains you have, there is no reason to salvage ones that have become dirty. Can I make my own kefir grains from water or other ingredients? Grains do not spontaneously generate from adding sugar to water. The grains are made up of numerous organisms in a complex matrix. Simply pouring probiotic capsules into sugar water will not lead to grain formation. Source a quality culture and it will provide a lifetime supply. Water kefir is very easy to make. 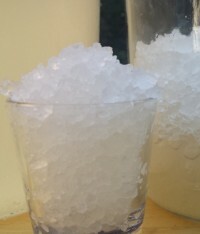 Simply add 2 tablespoons of water kefir grains to 1 quart of water with ¼ cup of sugar. Stir the sugar into the water to dissolve completely, then add the grains and cover with a lid or towel. After 24-48 hours, harvest the drink and then put into bottles with flavoring (if desired) to help build carbonation and a less sweet flavor. What supplies do you need to make water kefir? 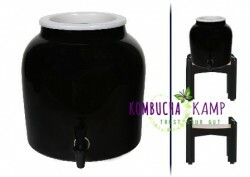 Water kefir supplies include a jar, quart size or larger is generally best. A spoon of any material may be used to stir in the sugar. 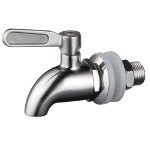 Any type of strainer will work to recapture the grains. Then it’s just having a few bottles or mason jars handy to store the finished water kefir. The tighter the lid, the more carbonation! Do I have to use organic ingredients when making water kefir? Organic ingredients are not required for fermentation, but if they are available we recommend them and all KKamp fresh live cultures use organic ingredients (except the wildcrafted local raw honey in our JUN cultures). What type of container is best for fermenting water kefir? Quart, half gallon or gallon jars are easiest for fermenting water kefir especially if it has a wide mouth so it’s easy to stir the sugar and strain the grains. A plastic lid or cloth cover will both work. Does the order of the ingredients matter in making water kefir? To prevent breaking the grains into smaller pieces which could flow through the strainer, stir the sugar before adding them to the vessel. How long can you let water kefir ferment? The grains need to be fed frequently or else they will disintegrate. We recommend 24-48 hours for the first fermentation and then another couple of days in the bottle with flavoring (optional) for the best flavor profile. What temperature does water kefir prefer? Water kefir prefers temperatures of 68-78°F (20-26°C). 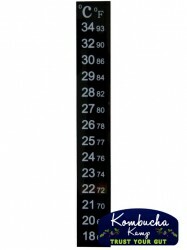 Using a thermometer strip will help keep track of the temperature and sometimes they will need a heat source especially in colder months to help them ferment and proliferate. 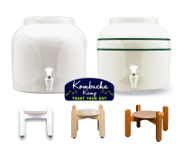 Should I use a lid or cloth cover with water kefir? 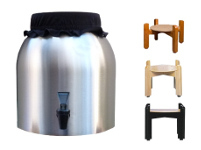 Either a lid or cloth cover will work to ferment the water kefir. We’ve done it both ways and don’t detect a noticeable difference between the two. What kind of sugar can I use for water kefir? Plain white sugar is the easiest for the water kefir grains to consume, plus it’s cheapest, and as a result is the most popular. Other sugars that have more minerals (brown sugar, coconut palm sugar, piloncillo, rapadura, etc) may be suitable from time to time. But if the grains start to change shape or get mushy, switch back to white sugar until they restabilize. Does water kefir have a sugar preference? Yes. Water kefir does best with plain white sugar or unbleached organic sugar. Mineral rich sugars may be used sparingly as they can over-nutrify the cultures, causing them to get mushy. How do I stir in the sugar for water kefir? Add the sugar to the jar and then stir vigorously (don’t splash!) until all of the sugar is dissolved. Sometimes a few crystals of sugar will remain at the bottom. To fully dissolve the sugar more easily, assuming a 1 quart batch, you can heat one cup of water and stir in the sugar, then cool quickly by adding the additional 3 cups of cold water. The grains can go in as soon as the water is no warmer than body temp (use a finger to test). What is the best molasses for water kefir? We use molasses occasionally as a nutrifying agent and to switch up the food supply for the grains. Blackstrap molasses has a higher mineral content and those nutrients are passed on to you in the final brew but it can also have a distinctive flavor that not everyone enjoys. Can I make water kefir with less sugar than the recipe says? Keeping in mind that the sugar is food for the microbes rather than us, it is best to follow the recipe. However, if less sugar is desired or for a shorter fermentation time, you can cut the sugar by no more than 25%. Any less than that and the grains will degrade. Can I use honey to make water kefir? 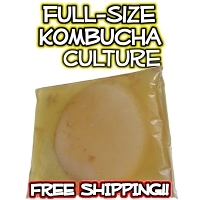 Nearly all fermentation cultures are “flexible technology” meaning they can be used with a variety of different substrates to create unique ferments. If the grains appear to disintegrate, switch back to the original recipe to rehabilitate them. Yes, check out our sugar free coconut water kefir recipe here. Can I use fruit juice to make water kefir? Yes but the acid in the juice may cause the grains to disintegrate. You may alternate between fruit juice and sugar water to keep the grains healthy. Or the best way to kefir juice is to brew up a batch of water kefir, strain out the grains and then add the kefir water to the juice. Give that combo a couple of days to ferment and drink it when you like the taste. Start with 25% kefir to 75% juice and play with the ratios to find what you prefer. Is water kefir a probiotic? Yes! According to the World Health Organization, a probiotic is an organism that “confers a benefit to the host.” Water kefir is teeming with bacteria and yeast along with organic acids and nutrients in a living form. Is there alcohol in water kefir? Water kefir may contain trace amounts of alcohol, just as all fermented beverages do, but the amount is usually low, around .2% – .8% and not intoxicating. If bottled with sweet flavors and left in a warm place, both alcohol and bubbles can build, so watch your bottles carefully! To keep the amount of alcohol in the bottle to a minimum, drink the water kefir soon after flavoring or store in the refrigerator to keep cold. Is there sugar left in water kefir? Sugar is the natural food source for the bacteria and yeast in water kefir grains. The longer the grains ferment the water, the less sugar remaining. However, the grains need to be fed consistently or they will eat themselves and disintegrate. That means we may need to harvest the water kefir before it has a flavor or sugar content level we enjoy. By straining the grains and allowing it to ferment longer in the bottle, less sugar remains. How many calories does Water Kefir contain? Calorie content of water kefir is determined by the amount of sugar remaining when you remove the grains. The longer the kefir ferments, the more sugar is consumed by the yeast and bacteria. This is true even in second ferment, after removing the grains and bottling. A common estimate is 20-30 calories per 8oz, but that figure may be high or low depending on your process. Is there gluten in water kefir? No! “Grain” is a term of convenience for the water kefir polysaccharide rather than a literal description. Therefore it is naturally gluten free! Coconut water kefir is easy to make. Simply at 2 tablespoons of kefir grains to 4 cups of coconut water. Let it ferment for 24-48 hours, then strain and enjoy! Click here for the full Coconut Water Kefir Recipe. How do you store water kefir grains? Water kefir grains are like people in that they do not like it if you ignore them! They thrive when they are fed consistently. However, if you need to take a break, then store them in the fridge in sugar water and change it out every 7 days to keep them fresh. How long can you store water kefir grains in the fridge? Ah the mysteries of microbes! The short answer is forever provided when it comes time to rehabilitate them they are fed every 24 hours over several cycles to bring them out of dormancy. 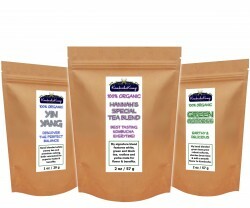 See our water kefir recipe page for tips on renutrifying grains. Sometimes they can last years other times they may not survive more than a couple of weeks. Patience, perseverance and observation will inform if they are revivable or not. How do you dry water kefir grains? It’s easy to dehydrate water kefir grains. Simply spread them out on a dehydrator sheet, set the temp to 100°F (38°C) and the timer for 24-36 hours. If you don’t have a dehydrator, use the lowest possible oven setting with the door cracked slightly to try and maintain as close to 100°F (38°C) as possible (bacteria death starts around 108°F [42°C]). It may also be possible to air dry the grains successfully. Why are my water kefir grains floating? Water kefir grains will sometimes float when enough sugar has been eaten by the organisms. They create effervescence as a byproduct of the fermentation process which will propel some grains to float around in the vessel. Shake the vessel from time to time and you may see bubbles floating up from the grains. Are my water kefir grains dead? The easiest test to confirm if water kefir grains are working or not is to add a couple of raisins and allow it to ferment for 3 days or so. If the raisins float, then they are working. My water kefir grains aren’t growing, any ideas? Water kefir grains need to be fed regularly to spur growth. Refresh the sugar water every 24 hours until growth occurs.